Install and adjust a seat with a hex wrench. Choose the right bicycle seat, and the miles fade away. Choose the wrong seat, you're sore and feel like abandoning your bike. Don't be afraid to experiment. Seats are easy to remove and install; most bikes employ the same seat clamp configuration. With a carbon-fiber frame, tighten bolts or screws cautiously. Over-tightening damages carbon. Loosen the large, vertical bolt on the seat collar directly under the seat with a hex wrench. This loosens a clamp that secures the seat rails. Grasp the seat with one hand and swivel it to one side. If it won't slip out of the clamp, loosen the bolt more but don't remove it. Remove the seat from the clamp when the bolt is sufficiently loose. Lift the top of the clamp slightly with one hand. Reverse the procedure for installing the new seat by turning the seat slightly to one side. Slide the two rails on the seat under the top of the clamp. Turn the seat parallel with the top tube of the bike as if it were already installed on the bike. The two-part clamp has U-shaped indentations. The rails fit into the indentations. When the rails fit into the indentations, the seat should feel somewhat steady. Slide the seat forward or back inside the clamp to center it. Tighten the bolt with the hex wrench. Ride the bike on a smooth, flat surface out of traffic. Your knees should have a bend of 5 to 10 degrees at the bottom of the pedal stroke. If not, stop the bike. Loosen the horizontal seat-post pinch bolt with a hex wrench at the top of the seat post where the post emerges from the bike frame. Grasp the seat with both hands, and swivel it to lower or raise it as needed. The post and seat will move up and down together. Tighten the pinch bolt and test ride again. Adjust as needed until your knees are bent correctly at the bottom of the pedal stroke. Ride the bike. The two bones in your rear-end, the "sit bones" should be centered over the thickest part of the seat in back. If you feel pressure forward, the nose of the seat is too high. If you're sliding forward, the nose is too low. Stop the bike. Loosen the vertical hex bolt on the collar under the seat using the 5 mm hex wrench. Slide the seat forward or back to center your sit bones over the thickest part of the seat. Tilt the nose of the seat up or down to level it, or angle it up or down as needed. Ride the bike and adjust as needed until comfortable. Tighten the nut securely and continue riding, testing and adjusting as needed. Seat adjustment is subjective. Make adjustments as needed for your own type of bike and riding style. 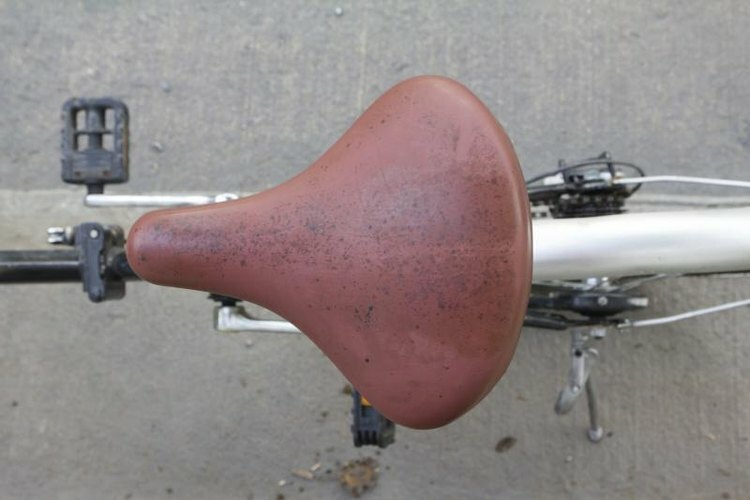 It can take weeks of riding to properly dial in a seat by taking note of sore spots or chafing. Take a 5 mm hex wrench with you when you ride, and adjust the seat as needed. When you forget to make adjustments, you've got it right. Many cyclists opt for wider seats, which can cause problems with soft-tissue irritation. Accustomed yourself to a narrow seat for best results.